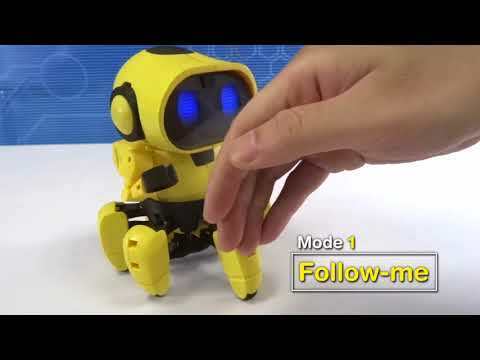 Build a clever intelligent robot that walks, follows and explores with great interaction. This colourful build kit comes with an easy to follow instruction manual and takes one to two hours to complete. Standing 16cm tall, Tobbie the robot walks on six legs and has two interactive modes. In 'Follow Me' he will happily trail along after anyone that closely approaches him. In 'Explore', he roams using his intelligent infrared sensors to avoid obstacles and turns aside when coming across anything that blocks his way. With fun sounds and effects and LED eyes, very satisfying to build and great fun to play with. Smart!